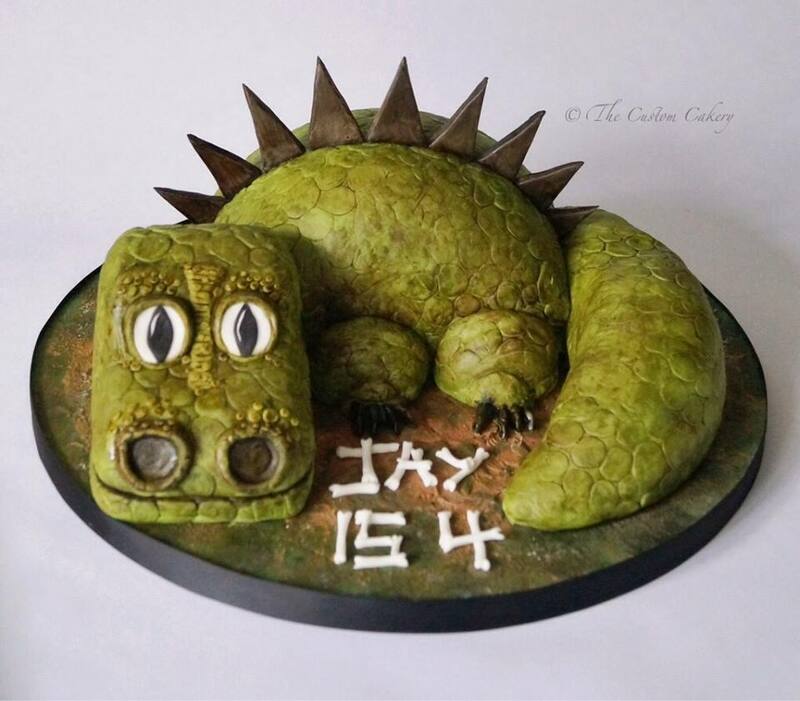 Cake Decor in Cairns: Spotlight on The Custom Cakery! Spotlight on The Custom Cakery! Have you missed Cake Seller Spotlight day lately? I have been super busy with school holidays and you know I make no promises to sticking to timetables! Family first! My gorgeous lil 6 year old went back to school today, so I am going to start catching up on the posts you love the most! This week, I am again showcasing one special Cake Seller. There are so many wonderful artists out there and I want to be able to help give them recognition and praise for being so talented and awe inspiring. And of course indulge in my cake crush addiction. Any Cake Sellers who have participated in Cake Seller Monday on Facebook have the chance to be chosen. The honour of having a dedicated Day just for you will be determined by some loosely derived criteria. Melanie Williamson : The Custom Cakery! 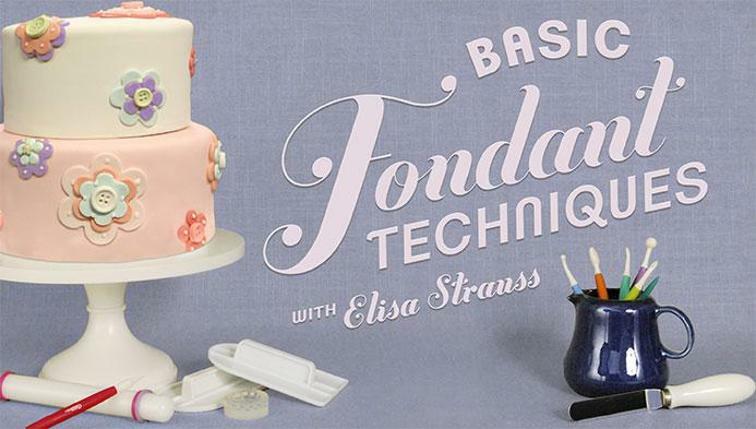 I was introduced to Melanie's flippin gorgeous cakes late last year on Google+, actually it was also the same time I met a group of the most supportive friendly online cakers from around the world. We all have different abilities, strengths and talents and we've formed a special bond that keeps on empowering each other all things cake and everything else on the side! So anyway, back to the fabulous Mellie! Eeeek it's so hard to know where to start. This one is tricky because I have such an adoration of her cakes, but I also love our friendship so it's a fine line between cakey love and biased friendship!!! Okay, okay I will settle down now. I just get so excited about these things you know. Its so lovely to have a hobby that connects me with so many lovely people, and we are all so lucky that we have the internet - bringing each other closer to home. Mellie has sooooooo many cakes to choose from, it was incredibly hard to pick my favourites as I really just love them all!! ( Oops there I go again!) I narrowed it down to the most difficult, most inspiring cakes that I would love to one day be able to pull off. Everything from 3D structures to elegant shoes! So earlier in the year Mellie tells us she was working on a structured cake. I'm like cool, sounds great. Then the next day she sends me a photo of this giant 3D lolly cake and I am like "OMGOSH! Wowzers!!" Having no idea who he was or just why she was calling him Bertie, I had't realised just how talented this piece of work was. 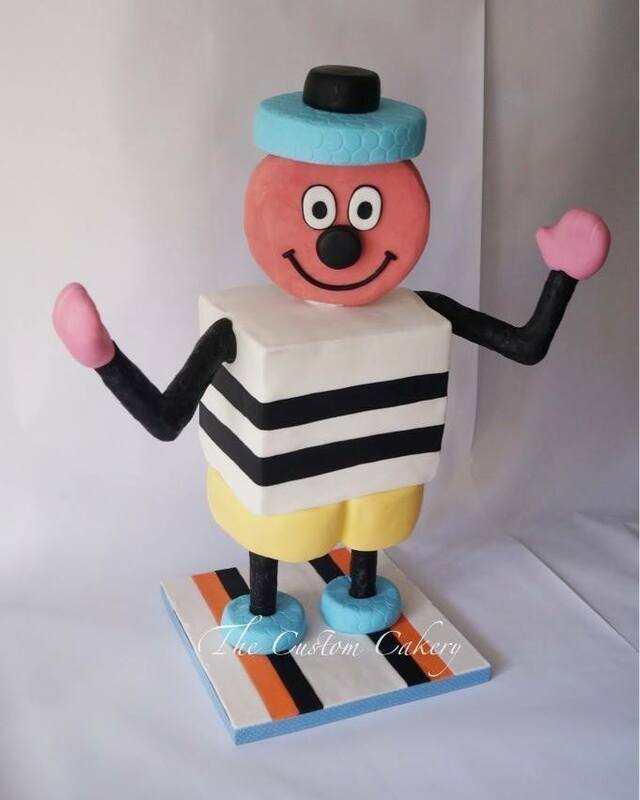 Not only had Mellie created this spectacular cake - she'd also replicated a popular UK Mascot Bertie Bassett! Oh I cannot even comprehend how Mellie put this cake together, looking at the structure alone is enough to send my head spinning! And if you go back to the selfie photo further above, you can see just how big Bertie actually is compared to his clever creator! OMGOSH!! The Custom Cakery is getting a bit of a reputation for awesome kids cakes, I suspect due to being a mother to four gorgeous kids Mellie has plenty of inspiration and motivation to dazzle even the most serious youngin (Hahah is that even a real word?) I mean check out Dave the Dinosaur here! What's not to love? The reptile skin texture really shines and I just want to rub his nose! My son would love this cake, but sadly Melie lives too far away - if only we could teleport. Okay so you might be one of the lovelies thinking, yeah kids cakes are cool but I like a more grown up type of cake. Well get ready to have your socks knocked off! Because the next two cakes just blew mine away! Mellie's got you covered both in the kitchen and out for an evening of indulgence! Can you hear me? "OMGOSH OMGOSH Love Love L-OV-E!" Yes that's exactly right! 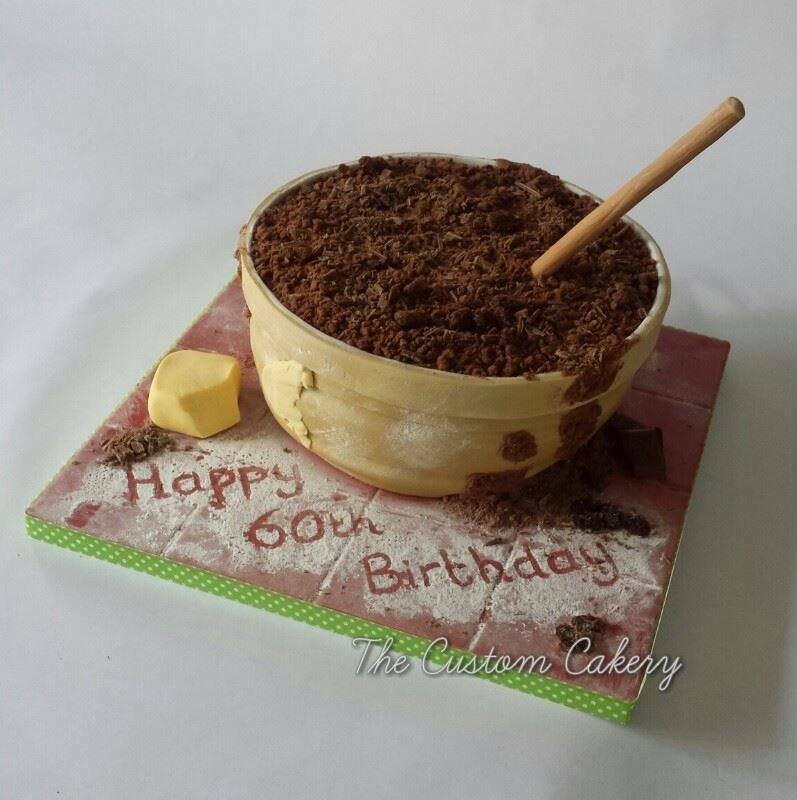 This Mixing Bowl cake screams the absolute love and joy I have for cake making and I can just imagine how happy, how treasured this lucky 60year old was feeling when she received her 60th birthday cake. Such a special, thoughtful and incredibly awesome cake! I just want to grab that spoon and give it a stir and a lick of the bowl!!! And check out that Happy Birthday! Isn't it cleverly done in flour? Fantastic effect! Okay so my heart has started those trademarked palpitations. It's so much fun picking cakes to show case and writing about them - it's like a whole new excitement looking at them in this way! I could look at cakes all day! I just love them! But before my heart goes into overdrive, I better not forget to post the last gorgeous cake, such a stunning, elegant cake, I know you're going to love it as much as I do, if not more!! Isn't this cake divine? My eyes keep looking at it up and down taking it all in! 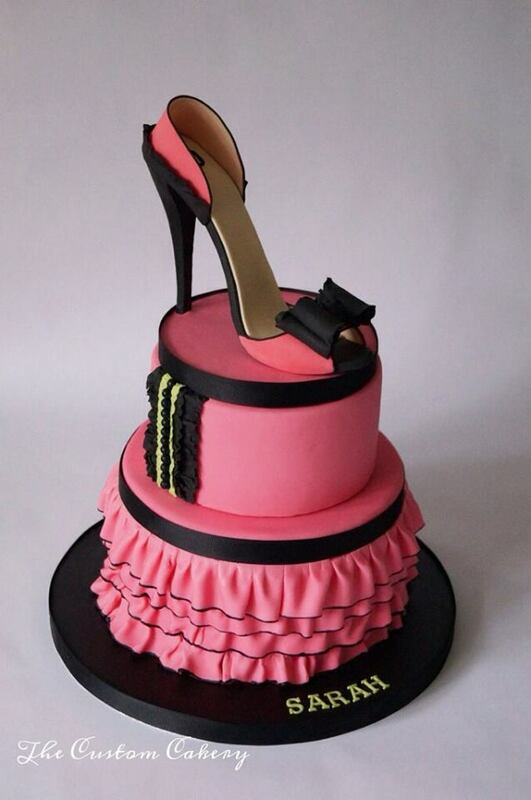 A simply stunning edible shoe - yep it's all freaking edible!! Now you know why I get so excited when I mention this cake! I love this cake!! I flippin LOVE this cake!!!! Such elegance and style (ironically all of which I am not haha!) I reckon Sarah is one absolutely lucky girl to have had this cake stunningly made for her! Have you fallen in cake love as much as me now? 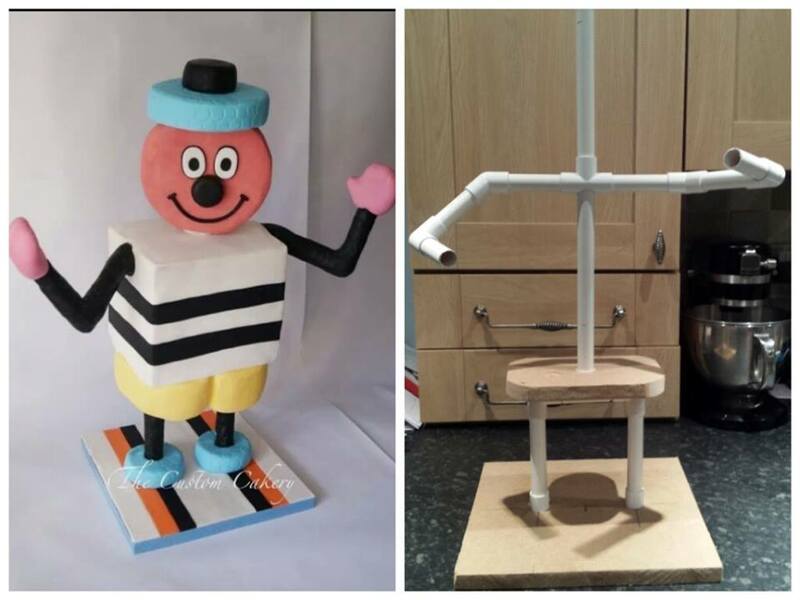 Once I calm down again, I will be on a mission today to let more of the cake loving world know about Melanie Williamson and her awe inspiring cakes! 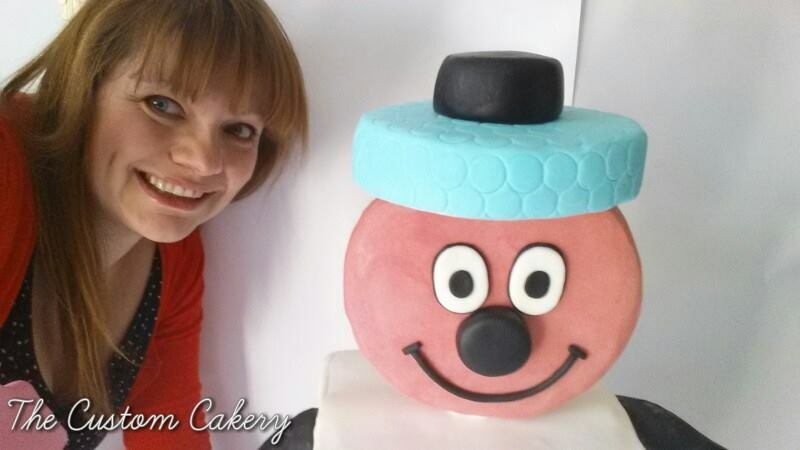 I am going to share a few of her cakes directly onto my Facebook page, Google+ and Pinterest. My goal is to end the week with Melanie receiving a heap more love from you all across her social networks .